Height 5 feet 5 inches. Weight 116 lbs. Chest measurement 31-33 inches. Complexion dark. Eyes blue. Hair dark. Sight - both eyes 6/6. Hearing and colour vision both normal. Limbs well formed. Full and perfect movement of all joints. Chest well formed. Heart and lungs normal. No illnesses. Free from hernia, varicocele, varicose veins, haemorrhoids, inveterate or contagious skin disease. Vaccinated (left). Good bodily and mental health. No slight defects. No fits. Had polypus removed from nose. Class A. On troopship Turakina at sea en route to England. Aubrey Edward Thompson was born on 14 April 1882 at Timaru, the third son of Annie Elizabeth (née Robson) Thompson and the late James Thompson. The first-born son died in infancy. His given names in the birth registration were Edward Aubrey, but he went through life as Aubrey. His early education was at Pleasant Point School, where his father was the headmaster for many years. James Thompson, from Northern Ireland, died in 1913 in Christchurch. Aubrey was a cheesemaker for the Barry’s Bay Dairy Company at Barry’s Bay, Akaroa, when he was called up in January 1917. In earlier days he had been a farm labourer at Aylesbury where the family resided for a time and at Kawhia in the Waikato. He had previously served with the Waimakariri Mounted Rifles from which he resigned. Of relatively small build, single and of Church of England affiliation, Aubrey enlisted on 17 February 1917 and nominated as next-of-kin his English born mother, then living at 119 Hawthorne Road, Cashmere. He left Christchurch on 7 March 1917. The men had mustered at King Edward Barracks, where they were addressed by the Mayor of Christchurch. The C.Y.C. and C.D.C. bands accompanied the draft as they marched to the station, where they boarded a special train for Lyttelton. An exceptionally large crowd gathered at the station to cheer the departing men; and perhaps Aubrey’s relatives were among those who travelled to Lyttelton to wave good-bye from the wharf. A memorial stone to Aubrey E. Thompson, of the 25th Reinforcements, is placed on his parents’ grave in the Linwood Cemetery, Christchurch. The name of 49026 A. E. Thompson is engraved on the Canterbury Provincial Memorial in Christchurch, one of 33 servicemen of the First World War remembered here. This memorial which consists of a low block with a tall spire rising from the centre is sited in Ruru Cemetery, Christchurch. On the front face of the memorial is the inscription “1914-1918 ON THIS PANEL ARE THE NAMES OF THOSE MEMBERS OF THE ARMED FORCES WHO ENLISTED IN THIS DISTRICT WHO DIED IN THE SERVICE OF THEIR COUNTRY IN AND AROUND NEW ZEALAND OR EN ROUTE TO OVERSEAS SERVICE AND TO WHOM THE FORTUNES OF WAR DENIED A KNOWN AND HONOURED GRAVE 1914-1918”. 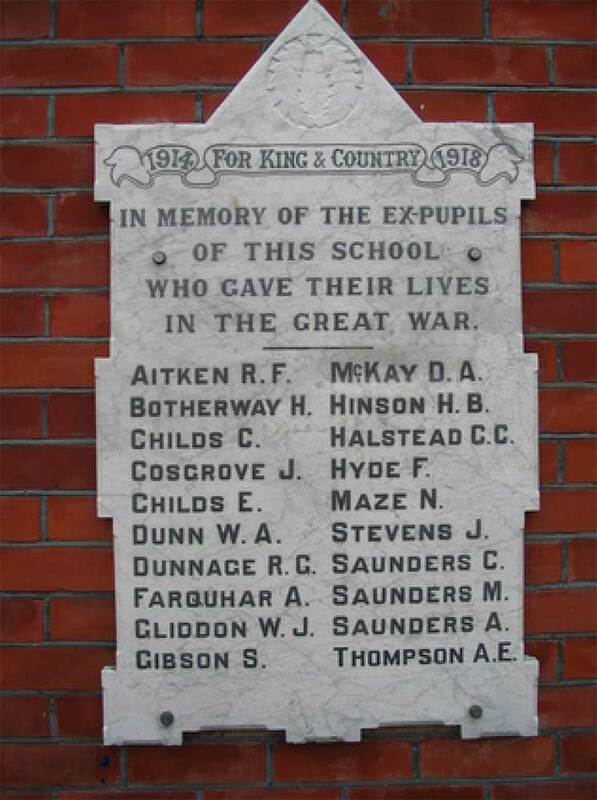 Aubrey is not forgotten by his first school – his name is inscribed on the Pleasant Point School War Memorial. The British War Medal was sent to his mother. His mother made a claim for pay due to her deceased soldier son. The consent was signed by all the brothers and sisters of Aubrey. It was in 1940 that the Public Trustee elected to administer the estate of Aubrey Edward Thompson. There was a £78 share in the estate of Robert Hepple Robson, a farmer who died in 1907, likely a brother of Aubrey’s mother. His sister Margaret Hepple Thompson who served as a nurse in World War One, died in 1921, her death resulting from war service. A younger brother, Eric Dudley Thompson born in 1893 at Rakaia also served in World War One.